Complete your meal with savory finishing butters or exceptional Harry & David ™ wine. 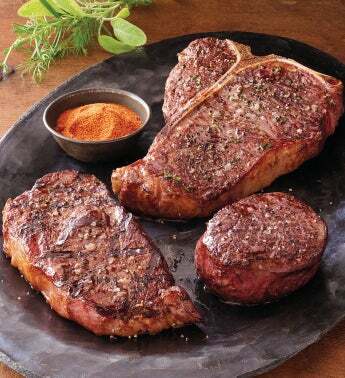 An exceptional gift for the steak connoisseur, our Epicurean Collection includes an unrivaled selection of premium cuts in your choice of USDA Prime or USDA Choice. Experience Stock Yards renowned Porterhouse, hand-trimmed Center-Cut New York Strip Steak, and perfectly marbled Complete-Trim Filet Mignon. Includes a tin of Peppercorn Steak Rub that adds just the right amount of flavor. Our collections are perfect when a single cut, just won&apos;t do.